From the 112th to 114th Congress (2011–2017), Becerra was the Ranking Democrat on the Ways and Means Subcommittee on Social Security. 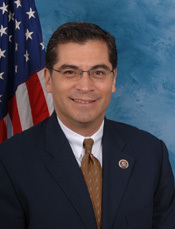 He joined the Committee on the Budget in the 110th and 111th Congresses (2007–2011), and in the 112th Congress (2011–2013) Becerra was appointed to the Joint Select Committee on Deficit Reduction. In 2008 then-President-elect Barack Obama considered Becerra for the Cabinet office of U.S. Trade Representative to advise him on international trade issues, but Becerra turned the offer down.53 In early 2017, Becerra accepted California Governor Jerry Brown’s appointment to serve as the state’s attorney general, returning to the lead the office that had effectively launched his political career more than two decades earlier. He retired from the House on January 24, 2017. 2Sean Cockerham, “Meet Donald Trump’s Newest Nemesis: Xavier Becerra, Son of Immigrants,” 21 December 2016, The Sacramento Bee, http://www.sacbee.com/news/politics-government/capitol-alert/article122331214.html (accessed 14 March 2017); George Skleton, “Capitol Journal: When a Door Opened Unexpectedly for Rep. Xavier Becerra, He Walked in and Impressed,” 8 December 2016, Los Angeles Times, http://www.latimes.com/politics/la-pol-sac-skelton-xavier-becerra-attorney-general-20161208-story.html (accessed 14 March 2017); James Bornemeier, “Rising Star Builds a More Visible Platform,” 24 November 1996, Los Angeles Times: A3; Politics in America, 2004 (Washington, DC: Congressional Quarterly Inc., 2003): 127; Matea Gold, “Xavier Becerra; Congressman Tests His Winning Streak,” 12 March 2001, Los Angeles Times: A1; Patrick McGreevy, “For Becerra, It’s Personal,” 19 January 2017, Los Angeles Times: B1. 5Tina Griego, “California Elections: Becerra Darts Past Two Favorites in 59th,” 7 June 1990, Los Angeles Times: J1. 6Mark Gladstone, “California Elections Assembly District 59,” 3 May 1990, Los Angeles Times: B1. 7“Final California Election Returns,” 7 June 1990, Los Angeles Times: A27. 8Gladstone, “California Elections Assembly District 59”; Griego, “California Elections: Becerra Darts Past Two Favorites in 59th”; Rodolfo Acuna, “The Candidate Who Upset Latino Politics,” 8 June 1990, Los Angeles Times: B7. 11Rick Holguin, “California Elections: Favorites Emerge in 4 Races Left Wide Open by Lack of Incumbents,” 28 October 1990, Los Angeles Times: J1; “Final California Election Returns,” 8 November 1990, Los Angeles Times: A27. 12Jerry Gillam, “Sacramento File,” 7 March 1991, Los Angeles Times: A16; Jerry Gillam, “Sacramento File,” 10 May 1991, Los Angeles Times: A41. 13Jerry Gillam, “Sacramento File,” 22 June 1991, Los Angeles Times: A26; Jerry Gillam, “Sacramento File,” 10 September 1991, Los Angeles Times: A20; Jerry Gillam, “California Laws ’92,” 1 January 1992, Los Angeles Times: A3. 14Jerry Gillam, “Sacramento File,” 29 January 1992, Los Angeles Times: A18; Jerry Gillam, “Sacramento File,” 5 February 1992, Los Angeles Times: B8; Jerry Gillam, “Sacramento File,” 30 May 1992, Los Angeles Times: B8; Jerry Gillam, “Sacramento File,” 29 August 1992, Los Angeles Times: A18. 15“Political Notebook,” 9 June 1991, Los Angeles Times: J3. 16George Ramos, “Assemblyman Becerra to Seek Rep. Roybal’s Seat,” 29 February 1992, Los Angeles Times: B3. 18David R. Ayon, “The Diminishing Returns of the Politics of the Barrio,” 30 September 1990, Los Angeles Times: M5. 19George Ramos, “16 File for Primary to Replace Rep. Roybal in 30th District,” 7 March 1992, Los Angeles Times: B2; Andres Chavez, “Hot Contest Shaping Up for Congress Seat,” 21 May 1992, Los Angeles Times (Nuestro Tiempo edition): 1. 20George Ramos, “Local Elections: 30th Congressional District,” 28 May 1992, Los Angeles Times: B1. 23Michael Meyers, “Final Election Returns,” 4 June 1994, Los Angeles Times: A18. 24George Ramos and Patt Morrison, “Elections ’92: L.A. County Latinos Headed for 6 Seats in Assembly, 4 in House,” 4 June 1992, Los Angeles Times: B3. 27“Biography of Xavier Becerra,” official website of Representative Xavier Becerra, accessed 29 May 2012, http://becerra.house.gov/index.php?option=com_content&view=article&id=13&Itemid=16 (site discontinued). 30Mark Z. Barabak, “California’s New Breed of Latino Lawmakers,” 16 July 1997, Los Angeles Times: A1. 31Garrison Nelson and Charles Stewart III, Committees in the U.S. Congress, 1993–2010 (Washington, DC: CQ Press, 2011): 579. 32“Welcome Teamwork on Immigration,” 16 March 1994, Los Angeles Times: B6; Ruben Navarrette Jr., “Immigration Ghosts Haunt the Hispanic Caucus,” 20 March 1994, Los Angeles Times: M2; Alan C. Miller, “The Washington Connection: Two Faces of Immigration Debate,” 2 July 1993, Los Angeles Times: A3; Politics in America, 1996 (Washington, DC: Congressional Quarterly Inc., 1995): 156; Karen Tumulty, “Jobless Bill Snared in Immigration Issue,” 15 October 1993, Los Angeles Times: A14; Politics in America, 1998 (Washington, DC: Congressional Quarterly Inc., 1997): 171; James Bornemeier, “Rising Star Builds a More Visible Platform,” 24 November 1996, Los Angeles Times: A3. 33McGreevy, “For Becerra, It’s Personal”; James Bornemeier, “The Washington Connection: A Lesson in the House Rules of Etiquette,” 17 December 1993, Los Angeles Times: A3. 34“House Passes Competitiveness Bill,” CQ Almanac 1993, 49th ed. (Washington, DC: Congressional Quarterly, 1994): 241–245, http://library.cqpress.com/. 35“House Education and Labor: Subsidized Premiums, Generous Benefits,” CQ Almanac 1994, 50th ed. (Washington, DC: Congressional Quarterly, 1995): 324–329, https://library.cqpress.com. 36“Plans Laid to Curb Immigration, CQ Almanac 1995, 51st ed. (Washington, DC: Congressional Quarterly, 1996): ch. 6, p. 9–18, https://library.cqpress.com. 37Politics in America, 2006 (Washington, DC: CQ Press, 2005): 132. 38Hearing before the House Committee on the Judiciary, Subcommittee on International Law, Immigration, and Refugees, Border Violence, 103rd Cong., 1st sess. (29 September 1993): 5. 39“Lawmakers Consider Other Bills Related to Law, Judiciary,” CQ Almanac 1996, 52 ed. (Washington, DC: Congressional Quarterly, 1997): ch. 5, p. 42–47, https://library.cqpress.com. 40Russell Berman, “White House and Senate Put Squeeze on House Democrats,” 12 November 2013, The Hill: 1; Alec MacGillis, “How Republicans Lost Their Best Shot at the Hispanic Vote,” 15 September 2016, New York Times Magazine, https://www.nytimes.com/2016/09/18/magazine/how-republicans-lost-their-best-shot-at-the-hispanic-vote.html (accessed 5 April 2017). 41Harold Meyerson, “Los Angeles Times Interview: Xavier Becerra,” 29 June 1997, Los Angeles Times: M3. 42Mark Z. Barabak, “California’s New Breed of Latino Lawmakers,” 16 July 1997, Los Angeles Times: A1. 43Robert A. Rosenblatt, “Latinos May Hold Key to Future of Social Security,” 25 March 1998, Los Angeles Times: A1. 44“$13 Billion in Welfare Cuts Restored,” CQ Almanac 1997, 53rd ed. (Washington, DC: Congressional Quarterly, 1998): ch. 6, p. 31–36; “No Accord on Welfare Rewrite,” CQ Almanac 2002, 58th ed. (Washington, DC: Congressional Quarterly, 2003): ch. 15, p. 3–6; Lizette Alvarez, “For Hispanic Lawmakers, Time to Take the Offensive,” 25 August 1997, New York Times: A14. 45Politics in America, 2008 (Washington, DC: Congressional Quarterly, Inc., 2007): 131. 48Almanac of American Politics, 2010 (Washington, DC: National Journal Group, 2009): 221. 49Marc Lacey, “Rep. Becerra’s Trip to Cuba Hits a Nerve,” 9 January 1997, Los Angeles Times: A16; Barabak, “California’s New Breed of Latino Lawmakers”; Alvarez, “For Hispanic Lawmakers, Time to Take the Offensive;” Carol Rosenberg, “Congressman Defends Trip to Cuba,” 20 January 1997, Miami Herald: A1; “2 Dade Lawmakers Quit House Hispanic Caucus,” 9 January 1997, Miami Herald: A8. In 2017, the CHC had a membership of 28 House Members and 2 Senators. “Members,” Congressional Hispanic Caucus, U.S. House of Representatives, accessed 3 April 2017, http://congressionalhispaniccaucus-lujangrisham.house.gov/members. 51Paul Kane, “Pelosi Says She Will Remain House Minority Leader,” 15 November 2012, Washington Post: A4. 53Almanac of American Politics, 2010: 221. "Xavier Becerra" in Hispanic Americans in Congress, 1822-2012. Prepared under the direction of the Committee on House Administration by the Office of the Historian and the Office of the Clerk, U.S. House of Representatives. Washington: Government Printing Office, 2013.